These letters were written by Pvt. Franklin H. Shirey (1838-1910), the son of William B. Shirey (1807-1861) and Sarah Harner (1812-1910) of Berks County, Pennsylvania. 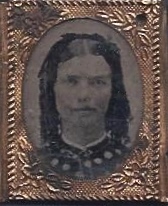 Franklin enlisted in Co. K, 179th Pennsylvania Infantry (a 9 month regiment) and served from October 1862 until late July 1863. This regiment was pretty much confined to garrison duty and never saw any action in 9 months of service. In February 1865, he re-enlisted in the 213th Pennsylvania, Co. D, for one year’s service, to avoid being drafted and to enable him to receive a veteran’s re-enlistment bonus. 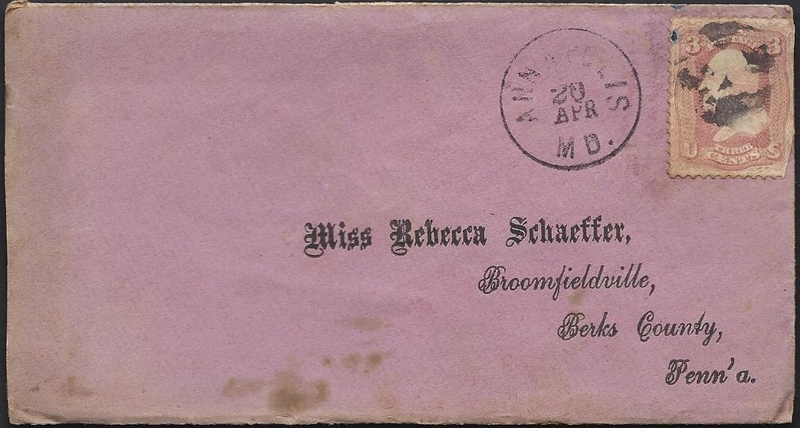 Franklin’s letters are all addressed to Rebecca F. (Breidenstein) Schaeffer with whom it was apparent that he had had a relationship with prior to re-enlisting. 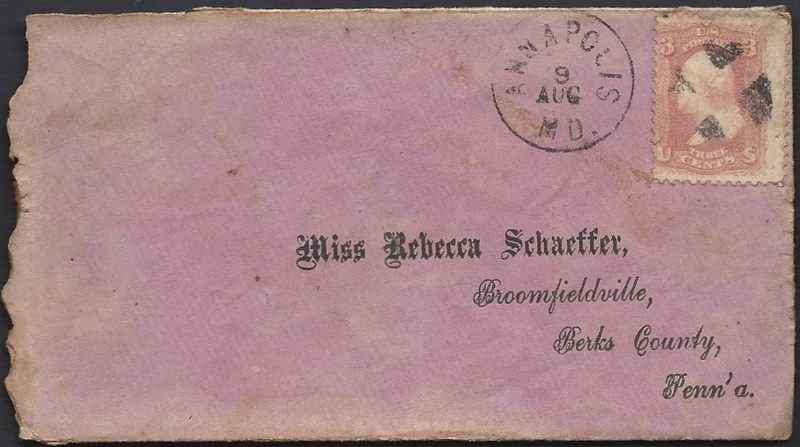 He carried on a correspondence with her while on duty at Camp Parole near Annapolis, Maryland, throughout the spring and summer of 1865, finally returning to Berks County to become her second husband in either September or October 1865. 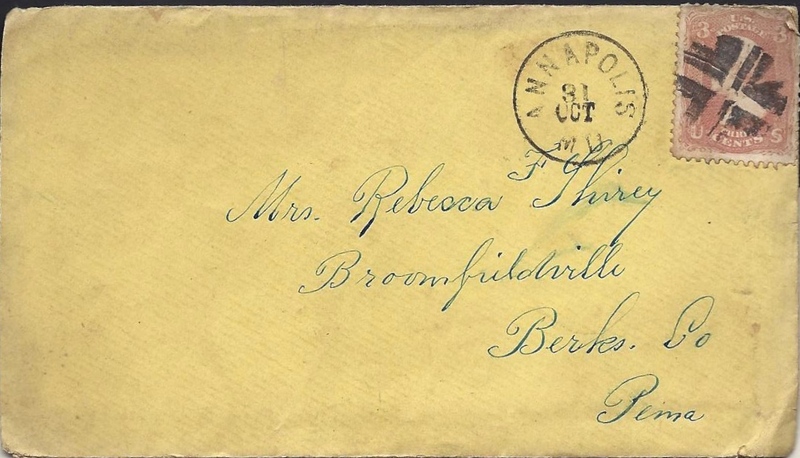 It isn’t clear from Franklin’s letters whether he was able to obtain a furlough to return to Berks County for the marriage. The letters suggest that he may have gone on “french leave” and when he returned to duty at Camp Parole, he was thrown in the guard house and expected to be court martialed. A regimental history, however, indicates that he mustered out with his regiment in November 1865. It is my opinion that there are only one or two letters among these that were actually written by Franklin who seems to have been barely literate. I believe most of these letters were actually written for Franklin by fellow members of his regiment, two of which are attributed to Pvt. Henry Keim. 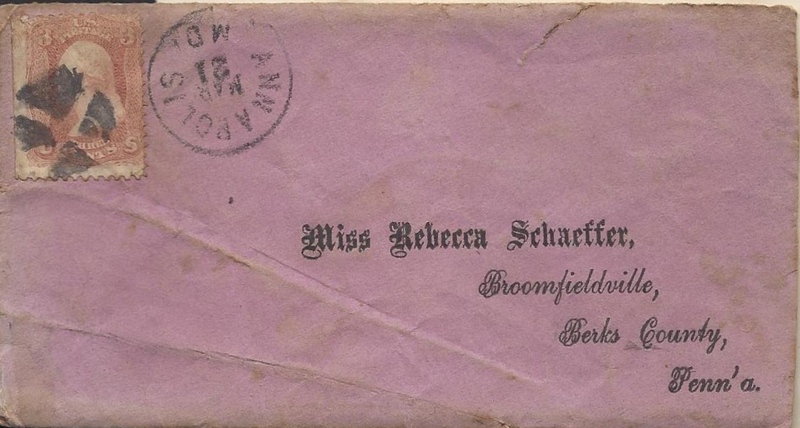 The letter of 25 October 1865 is signed by Rebecca but I don’t believe it was actually written by her either. 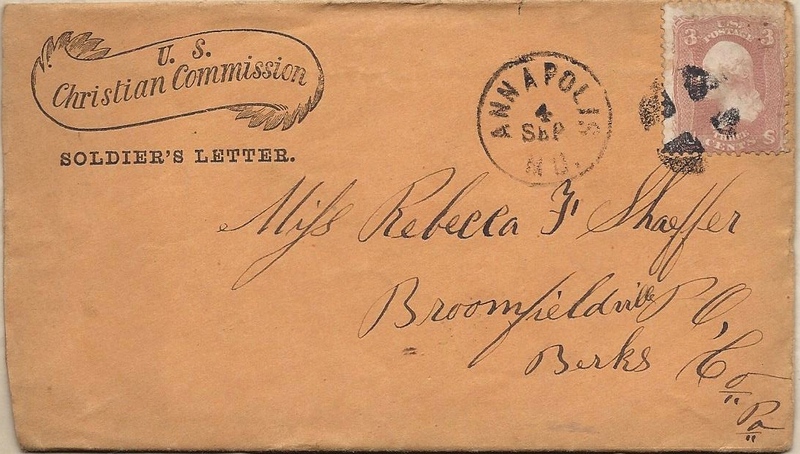 The handwriting and composition of the letter strikes me as very similar to that of the other letters. 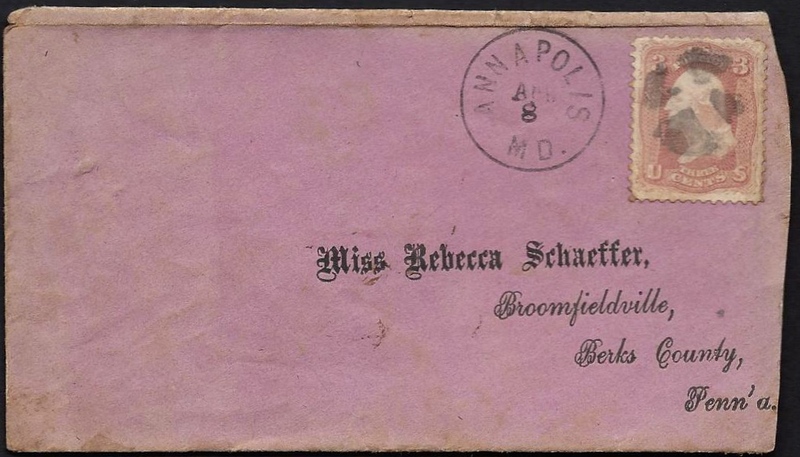 It is interesting that most of the letters were mailed in pre-addressed machine-printed envelopes which was highly unusual for private party correspondence in 1865. 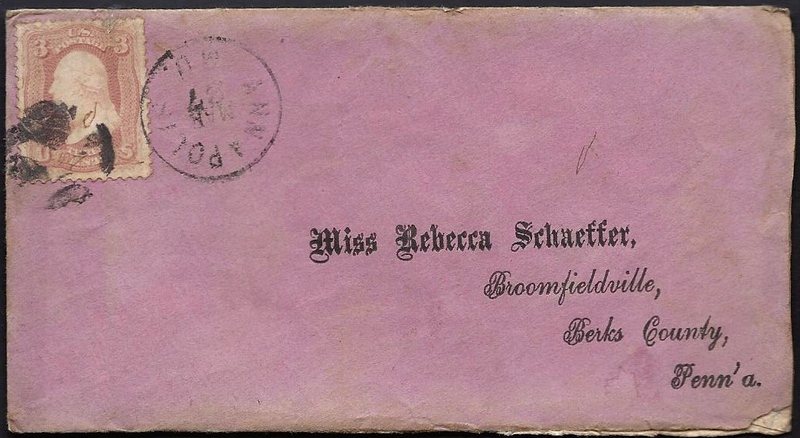 Perhaps Rebecca wanted to make sure that she received the letters and had them made for her semi-literate boyfriend and future husband. 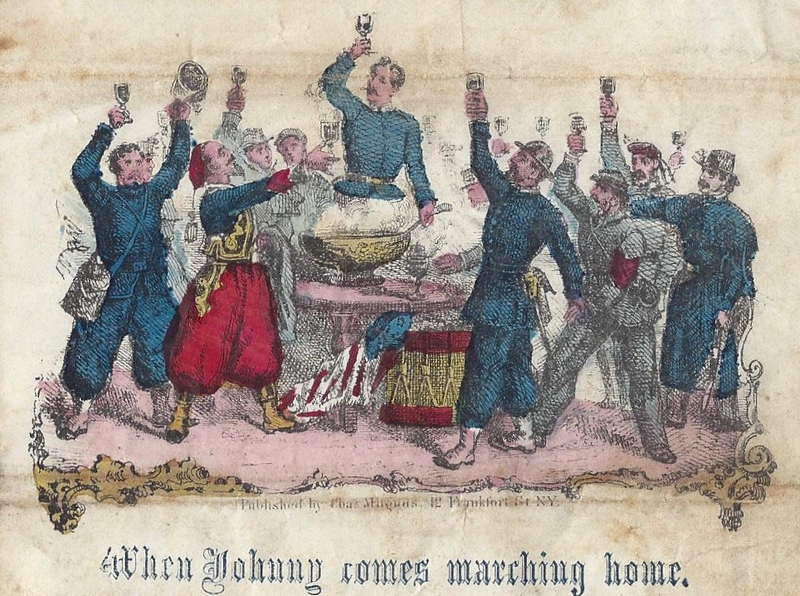 It is also somewhat rare to find patriotic stationary this late in the Civil War. I will drop a few lines to you to let you know that I am well at present time and I hope you are in the same state of good health. Further, I let you know that we are in the barracks and are living well. We have plenty to eat and to drink and are enjoying ourselves very good. I let you know that I sent you my likeness so that you can see how I look in solder’s clothes. Further, I let you know that we did not get our pay yet, but we expect to have it till Monday and then we will leave but where we will go I don’t know yet. But I don’t believe that we ever will see much fighting because the news are very good now. I will close my letter by letting you know that I love you in my heart and I love you in my liver, if I had you with me now, I would squeeze you till you quiver. You may not write till I write again because I don’t know the direction. I will drop a few lines to you to let you know that I am well at present time and I hope you are the same. And I also let you know that we left Philadelphia on Saturday for Baltimore and from there to Maryland or Camp Parole. I also let you know that I like it well yet. You may let me know how the draft worked [and] who was drafted. I have heard that I was hit and so I am glad that I have enlisted. I have more now than I would have had if i stayed ay home. Further, I let you know that I did not get any bounty yet and I won’t get any till the first pay day — that will be in six months. I will also state in my letter that the weather is very fine and warm here. It is quite spring-like. We struck tents yesterday and are quite happy we ain’t a doing anything but guarding parole prisoners. I take my pen in hand to let you know that I am well at present. I hope these few lines may find you in same state of health. I am sorry that I enlisted. I know it’s soon but know that [there was] no need going before a day ______ [?] I had ____ by the ______ tow in the guard house to be shot or be hung. I am on guard every day. It is warm here and cold in nights. I was wet too in the sleep in my wet clothes. Excuse my bad spelling and all my mistakes. I take the opportunity to write a few lines to you and let you know that I am well at present time and I hope that you are in the same state of good health. And you was _____ and Jeremiah and John and Harrison and you said something about me that I don’t like before you went off and I would like to know whether you would like to know whether you would come home before your time is up. 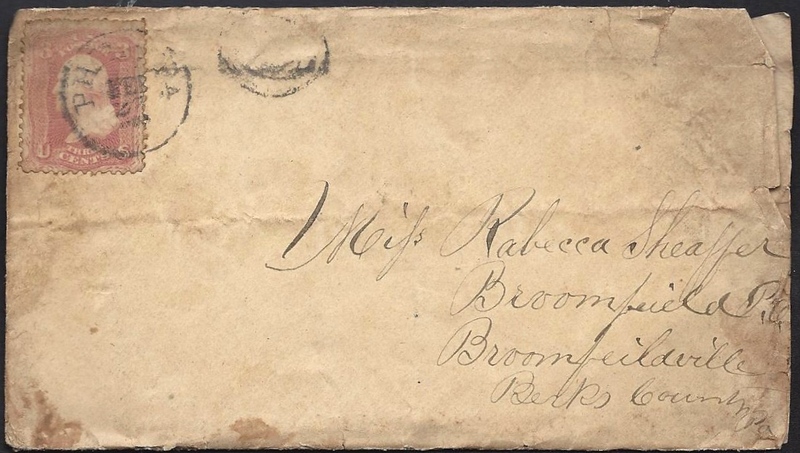 I was in Reading and let you courting make and I did get your likeness and I had to pay 36 cents for it and then tell me whether you got this letter from me. I have 2 from you. That is all what I have to write this time. I I go send a Rest Pen to you. I am out of postage stamps. I can’t get more here this time. I send you these few [lines] for to let you know that I am well at present and hoping these few lines may find you in the same state of good health. 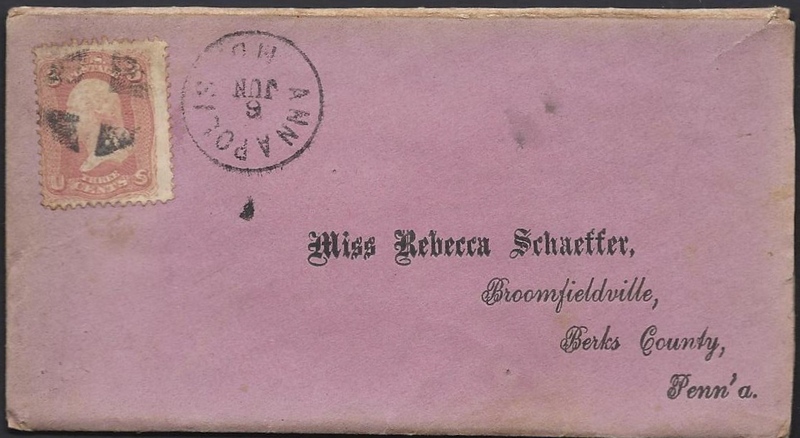 My dear love, I received your kind and welcome [letter] on the 26th and it had sixteen postage stamps in it. You keep the half of the stamps for yourself. My dear love, it is a damn lie. I didn’t say anything about your leaving me no in the next letter have told you so. My dear love, I don’t like it very well [here]. We have too much guard duty for to do on every day and of one night. It is cold at nights yet here and we have a good bit of rain out here. I might to God clear [a. k. a. desert] if I would [have] known it when we laid in Camp Cadwalader. Now I will send you this money for that likeness that you got. My dear love, I don’t know when I will get home again. I wrote two letters home and didn’t get no answers from them yet. I don’t know what is the reason. I guess I will be court martialled but we can’t get out of camp at all without a pass. I would like to know who all had to go [into the army by way of the draft]. We had mackerel and soup for dinner and sometimes codfish, beef, and pork. We have dress parade every evening. It looks lice when they are all in a row. And we have bare foot niggard prisoners here. There is three in the guard house — one for to be shot and two for to hang. The railroad runs close to camp. The Rose red, the violets blue, and sugar is sweet, and so are you, So no more at present. Write soon. I send some money home — thirty three dollars home, and I keep twenty dollars for to buy tobacco and pies. Pay ten cents for a pie. I will inform a few lines to you that I am well at present time and I hope you are in the same state of good situation too and we we got good news everyday. Richmond is taken and Petersburg too, and I hope the war will soon be over now. Lee’s army has surrendered and we expect to come home before our year is up. And I have just about half enough to eat. We get about one quart coffee, one quarter pound of meat, and one pound of bread, and one pint of soup in one day and that is just about half enough to eat for a man that does so much dirty [work] that we does. We have to be on duty two days and one night, then one night on pickets. Then we are free about twelve hours. Then we have to go on again. And this is the second letter that I write to you and received no answer yet. 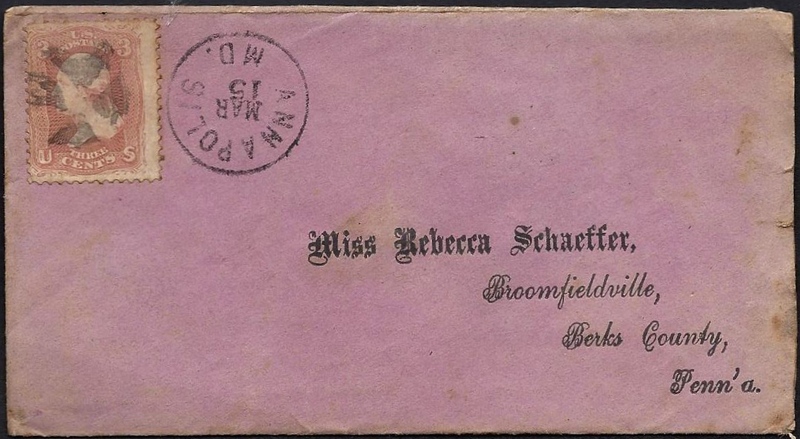 But I received one letter with post[age] stamps and when I want some more, I’ll write to you and then you shall send me some. And we got a circus show here in the city of Annapolis but I did not go. It cost too much. It cost one dollar to see it and I can have $30.00 for my watch but I won’t sell her. And now I must come to a close of this letter. It is time to go to bed and this is all what I can remember to you. And now write me soon as soon as possible. Co. D, 213 Regt. P. V.
I will inform a few lines to you that I am well at present and I hope these few lines will find you in the same state of good health. And I received your kind and welcome letter and I was very glad to. And I see in your letter that you get so much letters from me but this is the sixth letter that I write to you and if you get more letters than that, I told you that letters did I sent not to you. And I also will inform you that our President Lincoln has got murdered. And I hope the war would soon be over now. They captured five thousand and seven hundred prisoners from the rebel [army]. And I will also let you know about our ration. We get one quarter pound of meat and a half pound of bread in a day and we raised a flack and got great times and got a great fire in the evening. We burned about one 1,000 barrels on one heap and we were in great joy until the other day the dispatch came that Lincoln had got shot in the center of Washington. But then they all hung their heads when they heard that President Lincoln was dead. And I also let you know that I had sent $33.00 by Express home to my mother and I received no answer yet. I sent it on the 23rd of March and you shall tell my mother that she shall write me a letter whether she has received my money or not. And I also let you know that it rains nearly every day and in daylight, it is so hot — like in summer — and in the night it is so cold that the ground has frozen and I sleeps cold every night. And I wish I could sleep with you every night. Then I would sleep better than I did here and not so lonesome too. And you shall make yourself ready till I come home for to be married. Then we could live nice together and you shall tell my mother that she shall tell Jacob Fairung [?] that he shall send me five dollars of my money and if he got none, he shall lend some. I must have some money for to buy something to eat. And you shall send me your photograph now. I must come to a close of my letter for my paper is too small or else I would write you some more. I did not get stamps enough but I send them next time. Rebecca Shaffer, I take my pencil in hand to let you know that I am well at present time and I hope this few may find you in the same state of health. I will let you know that I am sorry that I enlisted and I wouldn’t let 1,000 dollars go leave this place this month and I don’t like it here and have got no rest here day or night. It is just the way you told me and I did not believe it. And you said I read so many letters to you. All letters I write to you is stamped. If you get any without your name is stamped, I didn’t write them. I would like [to] be vis[iting] you now. Then I would work with you in hay making. Then I would have some fun. But here I have no fun at all. And I am very lonesome here and I wish I could be at home this summer to work in harvest. Then I could work with you. But I do not expect to come home for a little while. And further I let you know that it rains very often and it rains last night all night. We must do duty [whether[ it may rain or not. And further I let you know that you shall send me those postage stamps now as soon as you can. I haven’t any more and I have sent three letters home and received no answer yet. I received no letter since the 11 of April. I could not see what is the matter that I do not get more letters from home. And you shall let me know whether you tell Jacob Fireing [?] about that money. I did not receive it yet. Tell him he shall send me $500 if he could spare it. I must have it to buy some tobacco. But I hope the war comes to a close now. Then we come home. Now this is all what I know. But keep yourself ready always. I do not know when we come home. But write me soon — as soon as possible. So I must come to a close of my letter. I could not remember more to [tell] you. Shall never fail and so I hope with you the same. Dear friend, if you please send me your photograph. Excuse my bad writing. I take this opportunity to inform a few lines to you and to let you know that I am well at present time and hoping that these few lines will find you in the same situation of enjoying good health. 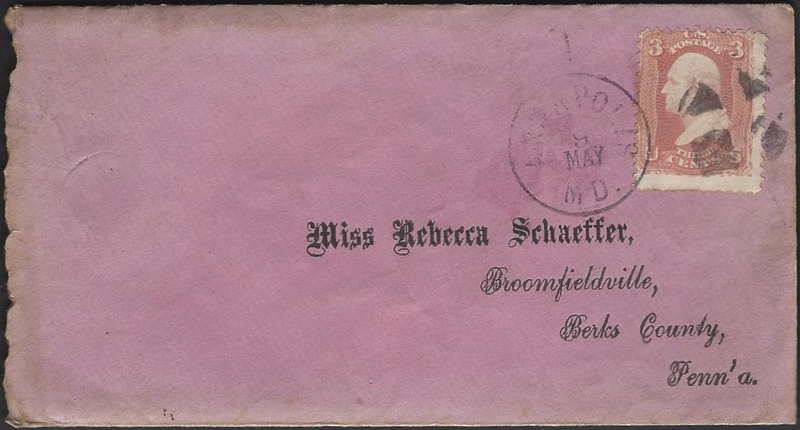 And further I let you know that I received your kind and welcome letter on the 31st of May which was dated on the 20th of May 1865. And that I received your postage stamps — 16 of them. But you had enclosed nothing in your letter about them postage stamps. They could [have been] taken out of that letter and I would find nothing out about them because you had enclosed nothing in [the letter] about it. And I see that you had stated in your letter that you had very awful, rainy weather at home and we had the same kind of rainy weather here and very awful hot weather here. It is not so hot any time in the year at home than it is here now. And further I let you know that our First Lieutenant [Lemon Buch] had resigned a few weeks ago and he had started off to go home today on the 5th of June. And I expect not to come home for this time now until we get further orders. But the war is over. It has no danger to come in a fight no more. But I guess we have to go to another place to do provost duty. And further I let you know that they captured Jeff Davis and [he] has to live on soldier’s rations now. But he had thrown his soup away the first time. But after that, he was glad to eat it if he just got it. And further, did you know that many soldiers got mustered out of the service? About 120,000 shall be discharged in this month. The 54th Regiment is mustered out already and so many soldiers had suffered to death of hunger — about 60,000 men. And further I let you know that the people [here are] plowing corn and commencing making hay till about two weeks. And so I must come to a close of my letter. My paper is all [full] and I could not remember more to [tell] you so much. From your true friend. So much from your true friend, — Franklin Shirely, Co. D, 273 Regt. 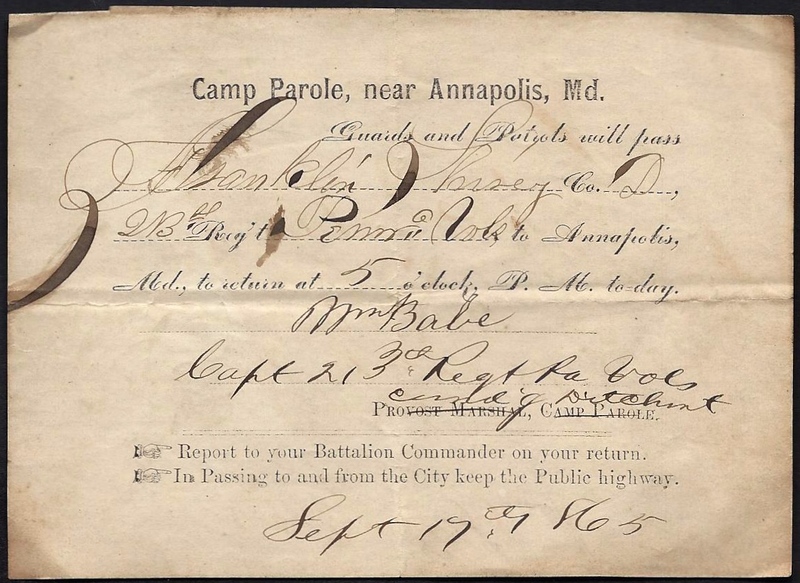 P. V., Camp Parole, Annapolis, Md., In care of Capt. John Kennedy. No more at present time. I take the opportunity to inform a few lines to you and let you know that I am well at present time and I hope you are the same. And further I let you know that I received your letter on the 20th of June. And you stated in your letter that must be married and wanted me to come home too as soon as possible. But I do not know when we come home. But I suppose they won’t keep us much longer. I could not see wether it is necessary to keep us longer but for that I could not tell when we come home but I suppose we won’t stay longer than three months till we get mustered out. But I will tell you something that you shall do. You shall write me a letter and put in that my mother were very poor and my brother were dead. Then I will show that letter to Captain. Then I will get a furlough to come home. Then we can make that thing all right. But write that letter so it shows that when one of my friends had wrote it to me and put another piece of paper in and put on your name so that I know who sent me the letter. Then I will throw that piece of paper away and show the letter to the Captain. Then I can get a furlough to come home and then we can get everything right. But send me 7 dollars money that I can go home with. But write me soon — as soon as possible — and do not forget to send me some money. And further I let you know that we have cherries enough to eat as much as we needed. And further I let you know that I could not tell you more now. My paper is very small and my time is short and my pen is poor and my ink is pale, and my love to you shall never fail. Excuse my bad writing. Co. D, 213 Regiment P. V.
Write as soon as get this letter. I now inform you that I received your most kind and welcome letter and indeed it gave me great pleasure to hear that you was among the living yet. And you had stated in your letter that you wished me home. Indeed, you know as well as I do myself that I would like to be at home to stay. I just received your letter today which I ought to have had last Saturday. I do not know the reason [it was delayed]. You need not trouble yourself about it. I think we will get home some of these times that you don’t think of it. I tell you when I get home, everything shall go all right. We will be married then and I hope we can live in peace. You need not listen [to] what the people say. I only wish I could be at home. We would be alright. If we [don’t] get home till fall, then we will go with him — Mr. Endy, and if not, we can move up next spring. He can get a house for us until I get home. 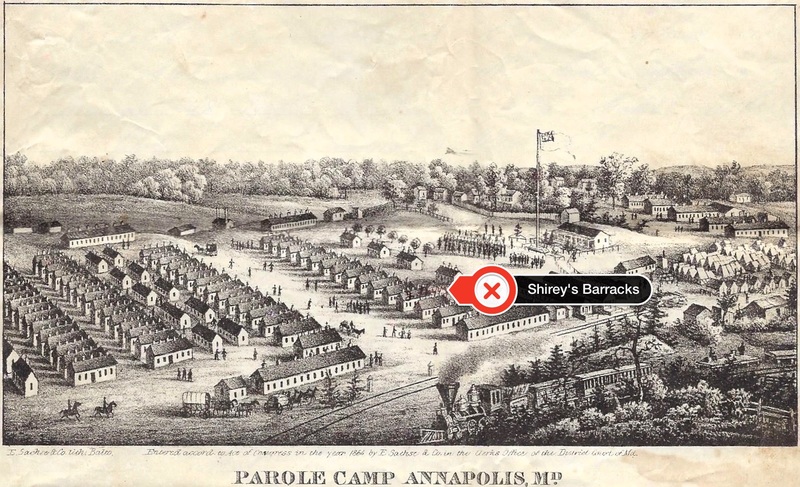 The picture I sent you here is [the] camp where we are stationed. Look on the house where my name is on [the roof]. That is the house where I live in. I must also let you know that I am well and still hope these few lines may reach [you] in the same state. I could be at home too but I don’t want to desert. Some of them fellows went home without leave. If I would do this, I might lose my pay yet. I have now already four hundred and twenty dollars to get and if we have to stay about two months longer, then I [will] have near five hundred dollars to get. With this, we can start nice. I must now tell you how we spent the fourth [of July]. In the evening, we had dances and had the whole barracks illuminated with candles until eleven o’clock. We have plenty of blackberries here. I go out often for some but the weather is so hot that we can hardly stand it now. All the paroled prisoners are all out of this camp. We are guarding the place so that the people don’t set fire to it. I inform you by these lines that I am well and was glad to hear that you was the same when you wrote this. I received your letter on the 21st of this month. You had stated in your letter that you would like to know when I was coming home. This is more than I can tell you now. We may leave for home in a few days and we may leave in a few weeks, and we may not get home until our time expires for all I know. But I would like to come home. I am tired of soldiering. This camp is all cleared — only to guard the buildings. There is only two companies here yet — Companies D and F. We expect to leave every day. If we don’t come to stay, then I will get a furlough in a month or two. We can all get a furlough for five days but I would sooner come to stay for I am tired of htis thing. I am from home five months now. Everything is all right when I get home. You need not trouble yourself about it what the people say. If I would not to marry you, I would not write to you. I trouble myself enough but I cannot help it. I can not get home any sooner here. I sent you a song. You must learn it until I get home. If I want to come home, I must sent home for money first. We are not paid yet. My stamps are all [gone] too. I can send you this letter yet I am out of money and out of tobacco. Put a few stamps in your letter when you write it to me. I must close. I can tell you more when I get home. I sent my love to you and I still remain your true and affectionate friend. Direct your letter to this place. I will now drop these few lines to you that I wrote a letter to you about three weeks [ago] and I received no answer yet. I don’t know what is wrong that you did not answer — whether you did not get it or what is wrong, I do not know. We are here yet but they are selling everything on the fifteenth and then we get away. You can look for us about the last of this month or the first of next month. 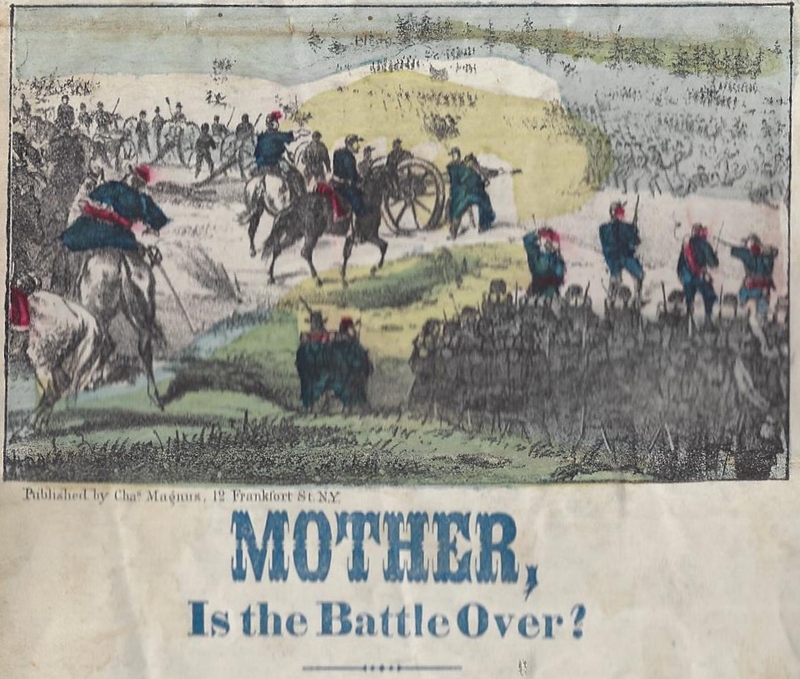 The 215th Regiment is mustered out and home, and the 214th is in Philadelphia and mustered out already. And both of them regiments come out after us one year regiments both of them here. 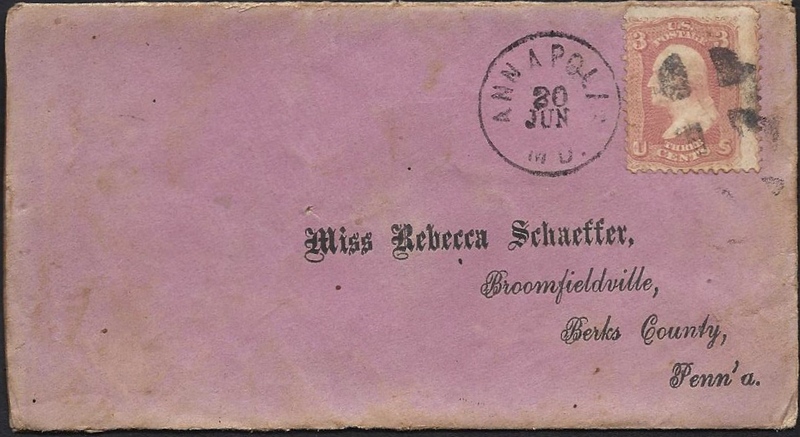 I send you one of our passes here which we must have to go to the City of Annapolis. This is the pass which I used. I am glad when we go home. I save my money as much as I can. I would like to come. I trouble myself enough but it cannot be helped. I get my money all in one heap then when I get home. Then we will get married. It will do just as good then. I hope everything is right when I come home. We live nice here now. We can get ready peaches here now and very cheap too here. I send you a picture — one of our boys this is. Further, there is a good many sick of our company. One died last week [on 2 August 1865]. His name was John Allbright. He was from above Reading. We have plenty of watermelons here too. I am always well and still hope these few lines may reach you in the same state. Let me know whether you have my accordion yet. I must close by sending my best love to you and I want you to write as soon as you receive this. I still remain your true and affectionate friend. I send a kiss to you. You will soon see me at home. I will inform you by these few lines that I am well and still hope these few lines may reach you the same. Further, I received this letter that you wrote on the 19th of last month. I had stated that I was coming home but I was wrong. We are not home yet so far. I don’t know when we are coming home. They are trying to keep us if they can. The officers are making money now. If they can keep us our year, they will. I received that letter with the stamps. We got paid off and I send four hundred dollars home and we will get paid off soon again. I will receive sixty-five dollars next time when we get paid off. I did not spend much yet. Some of the boys spent everything already. I will come as soon as I can. I will send you this for the stamps. I send you some more. I send my love to you. Goodbye, and kiss. Write soon. No more. 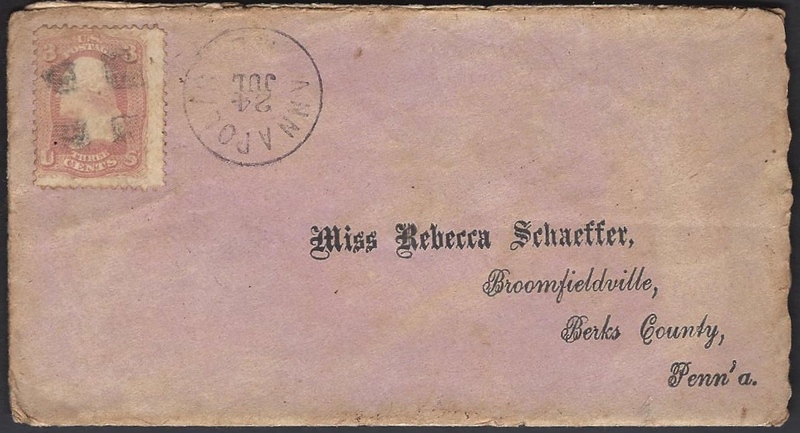 Editor’s Note: Sometime between the previous letter of 2 September 1865 and the 20th October 1865 letter that follows, Franklin Shirey returned to Berks County to marry Rebecca (Breidenstein) Schaeffer. I can only conjecture that Franklin used a pass dated 17 September 1865 which was only good for one day to leave Camp Parole and return home. When he returned to Camp Parole some three weeks later, he was thrown in the guard house for being absent without leave and he expected to be court-martialed for his actions. 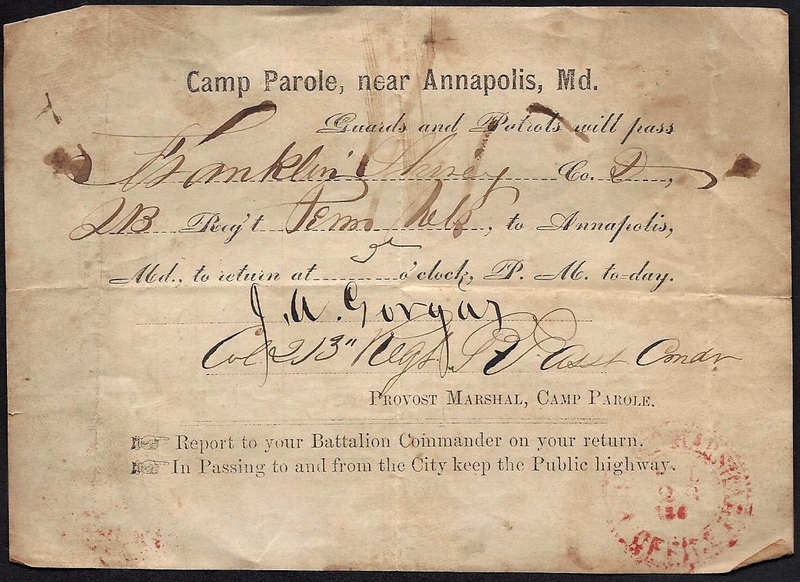 The one-day pass from Camp Parole likely used by Pvt. Shirey to return home to be married. I now take the pleasure opportunity of writing a few lines. My dear wife, I know you feel very lonely, I expect. Well, try and cheer up and keep a good heart. I got back to camp all safe. I am still in the guard house. I like it in here very well for we have a nice stove and we keep plenty of fire all night. I don’t have much work to do now for we have 11 men in the guard house. When I was coming through Baltimore, I missed the cars so I had to stay all night in Baltimore. Well, I went to a nice hotel and stayed there all night and it only cost me 75 cents. When I come back, my clothes were all right but my woolen blanket was stole and the Lieutenant said he would try and get it for me. I am well now but there is a great many sick. There is a good many coming back to camp from being home. All the officers [are] under arrest yet. When you write, send me 25 cents worth of stamps. That will be as many as I want. I will close by saying, goodbye my dear wife. Write soon to your husband. I take the opportunity to inform a few lines to you and let you know that I am well at present time and I hope these few lines may find you in the same state of good health. And I received your kind and welcome letter — the one [of] the 25 of October — and I was very glad to hear of you. I put 8 stamps in the letter and if you can’t stand it and if you get sick and then come home, I will do all I can for you and love you as long as I live. I was at the dance at Samuel Shirey’s last Saturday and your mother was there too. The children ask every day when you are coming home and ask me when you are [going to] get out of the guard house. You mustn’t get cross that I was at the dance. I wouldn’t go if it wasn’t so near and they had no rest till I came down. This is all I have to write this time. Write soon again. 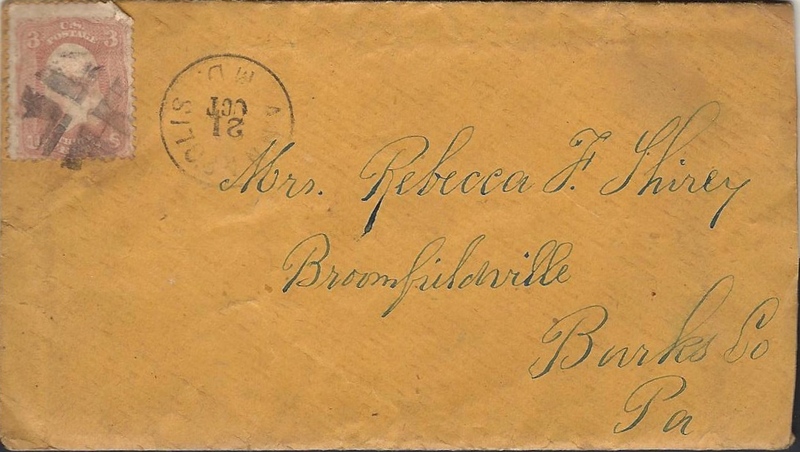 I received your letter dated the 28th and was very glad to hear from you and to know that you were all well. I am still in the Guard House. I like it here very well. I am well and hearty and I am well satisfied. I don’t like the idea of you going to that dance and don’t want you to go to an other place. I don’t know when we will be home — maybe before our time is out. We expect to have a large sale of government property — barracks and such things. I have not been court martialed yet but I don’t know when I will be. You must try and get along as well as you can at home and not feel worried about me for I am alright. You must buy wood until I come home. If you can’t stay where you are, you must get another house. I won’t buy no more butter here. It costs too much — only 70 cts a pound. You must keep this letter to yourself. Don’t let anybody see it. So goodbye.